Maximum containment [biosafety level 4 (BSL-4)] laboratories offer unique opportunities for research on emerging infectious diseases. Though maximum containment laboratories contribute to some of the seminal research on viral haemorrhagic fevers, very little has been written about the roles of these laboratories in infectious disease outbreaks response and preparedness. Drawing on interviews and data coming from maximum containment laboratories, the authors elucidate the complex roles of maximum containment laboratories in infectious disease outbreaks, using the recent 2013–2016 Ebola virus disease epidemic to highlight these functions. The first three sections define terms, discuss the unique research produced at maximum containment laboratories, and consider the barriers to operating these facilities. The next section focuses on the role of maximum containment institutions in capacity-building and surveillance as a part of emergency preparedness prior to the outbreak of an epidemic. Subsequently, the authors examine the function of these laboratories in emergency response as sources of subject matter expertise and as contributors to on-the-ground mobile laboratory systems. The chapter concludes with recommendations for improved collaboration between maximum containment laboratories themselves as well as between the laboratories and resource-limited countries most affected by the studied pathogens. World Health Organization. Biorisk management: laboratory biosecurity guidance. 2006. Contract No. : WHO/CDS/EPR/2006.6. 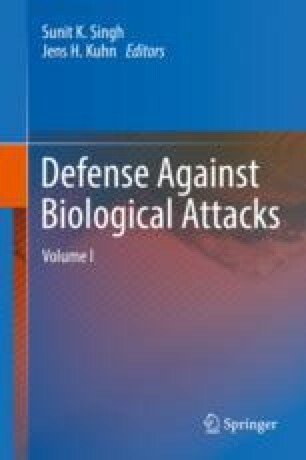 http://www.who.int/csr/resources/publications/biosafety/WHO_CDS_EPR_2006_6.pdf. Accessed 26 Sept 2017. Centers for Disease Control and Prevention. Bioterrorism agents/diseases. 2017. https://emergency.cdc.gov/agent/agentlist-category.asp. Accessed 17 Apr 2017. National Institute of Allergy and Infectious Diseases. The need for biosafety laboratories: more about biodefense. 2010. https://www.niaid.nih.gov/research/biosafety-laboratories-needed. Accessed 12 Aug 2017. World Health Organization. Programme to facilitate Variola virus research. 2018. http://www.who.int/csr/disease/smallpox/research/en/. Accessed 16 Apr 2018. World Health Organization. Background document potential Ebola therapies and vaccines. 2014. http://www.who.int/csr/disease/ebola/ebola-new-interventions-02-sep-2014.pdf. Accessed 3 Aug 2017. World Health Organization. Guidance on regulations for the transport of infectious substances 2015–2016. WHO/HSE/GCR/2015.2. 2015. http://apps.who.int/iris/bitstream/handle/10665/149288/WHO_HSE_GCR_2015.2_eng.pdf;jsessionid=05E6CCB02D28D1A234527E76009F8EEA?sequence=1. Accessed 18 Apr 2018. Wellcome Trust. Ethics and governance framework for best practice in genomic research and biobanking in Africa. H3Africa Working Group on Ethics; 2018. https://h3africa.org/images/Ethics_folders/Oct2017/Final%20Framework%20for%20African%20genomics%20and%20biobanking_SC%20.pdf. Accessed 18 Apr 2018. Allen E, Gans F. BU biolab gets approval for research on deadliest pathogens. The Boston Globe; 2016. https://www.bostonglobe.com/metro/2016/12/24/biolab-gets-cdc-green-light-for-level-research-but-still-needs-city-approval/xgYk6jljuTOyohcWRySTNI/story.html. Accessed 26 Sept 2017. Federal Select Agent Program. Select agent regulations. 2017. https://www.selectagents.gov/regulations.html. Accessed 27 Sept 2017. Penzenstadler N. Report: CDC could do more to keep laboratories safe. USA Today; 2017. https://www.usatoday.com/story/news/2017/05/25/report-cdc-could-do-more-keep-laboratories-safe/102109390/. Accessed 27 Sept 2017. Ksiazek T. National Biocontainment Training Center. 2015. http://www.dtic.mil/dtic/tr/fulltext/u2/1002976.pdf. Accessed 27 Aug 2017. American Association for the Advancement of Science. Biological safety training programs as a component of personnel reliability. 2009. https://absa.org/wp-content/uploads/2017/01/AAASBiosafetyTraining.pdf. Accessed 12 Aug 2017. World Health Organization. Emerging and dangerous pathogens laboratory network (EDPLN). 2015. http://www.who.int/csr/disease/OP_EDPLN_FINAL.pdf?ua=1. Accessed 3 Aug 2017. World Health Organization. New technology allows for rapid diagnosis of Ebola in the Democratic Republic of the Congo. 2017. http://www.who.int/emergencies/ebola-DRC-2017/articles/rapid-diagnosis/en/. Accessed 3 Aug 2017. World Health Organization. Factors that contributed to undetected spread of the Ebola virus and impeded rapid containment. One year into the Ebola epidemic. 2015. http://www.who.int/csr/disease/ebola/one-year-report/factors/en/. Accessed 20 Apr 2018. World Health Organization. Key messages from the WHO meeting on clinical aspects of Ebola virus disease. Advancing standards of clinical care. 2015. http://www.who.int/csr/disease/ebola/clinical-care-summary.pdf. Accessed 26 Sept 2017. U.S. Food and Drug Administration. Expanded access (compassionate use). 2017. https://www.fda.gov/NewsEvents/PublicHealthFocus/ExpandedAccessCompassionateUse/default.htm. Accessed 26 Sept 2017. Liberian Institute of Biomedical Research. Programs and capabilities of LIBR. 2017. http://libresearch.org/programs.html. Accessed 18 April 2018. World Health Organization. Ebola situation report, September 16, 2015: Map of Mobile Laboratories. 2015. http://www.who.int/csr/disease/ebola/situation-reports/16-september-2015-map5.png?ua=1. Accessed 3 Aug 2017. University of Cambridge. Call of duty: fighting Ebola in Sierra Leone. 2017. http://www.cam.ac.uk/research/features/call-of-duty-fighting-ebola-in-sierra-leone. Accessed 13 Apr 2018. Federal Select Agent Program. Occupational health program. 2017. https://www.selectagents.gov/ohp-app2.html. Accessed 27 Sept 2017. Courage K. Inside the 4 U.S. Biocontainment Hospitals that are stopping Ebola. Scientific American; 2014. https://www.scientificamerican.com/article/inside-the-4-u-s-biocontainment-hospitals-that-are-stopping-ebola-video/. Accessed 26 Sept 2017. Coalition for Epidemic Preparedness Innovations. Mission. 2017. http://cepi.net/mission. Accessed 26 Sept 2017. Global Health Security Agenda. Global health security agenda. 2017. https://www.ghsagenda.org/. Accessed 27 Sept 2017.